Colicchio and Sons - New York | Bentel & Bentel Architects/Planners A.I.A. COLICCHIO AND SONS, NY - Tom Colicchio, the chef and owner of this restaurant, firmly believes that cooking of any kind is a craft, not an art. At Craftsteak, he uses the highest form of uncomplicated culinary craftsmanship to explore the full flavor of each artisanal raised ingredient (especially red meat), on the menu, and serve these unadorned. Tom Colicchio’s approach to cooking once again motivated us to treat this former manufacturing space adjacent to The High Line in Chelsea as a significant ingredient into which we knit an extremely limited palette of oak, steel, wool, and plaster in order to explore the essential qualities of each element. To combine the elements gracefully, we utilized the simplest and most suitable craftsmanship required to join the parts together. Within these self-assigned parameters, our design had to address his desire for 225 total seats, 2000-bottle wine storage, and 3,000 square foot kitchen, contained within a 3,500 square foot first floor and 4,500 sf cellar. Our ultimate goal was to shape, within the one hundred year old shell of this previous National Biscuit Company bakery building, a simple yet texturally and spatially rich interior that integrates the context with the food and service both functionally and metaphorically. We hope the design ultimately weaves into the larger neighborhood context of Chelsea and The High Line rather than being imposed on it. New and existing elements – a new two-story steel and glass wine vault, a rough plaster and blackened steel wall, existing arched concrete ceilings and riveted steel columns, and a new rhythmically patterned oak, bronze and steel ceiling – join together to modulate the scale of the 16 foot high space of the first floor as patrons move through the hundred-foot long room. The spatial compression and release created by these elements provides varying degrees of intimacy while preserving the communal quality of a single room refectory that Tom sought. Through visual and tactile comparison of the materials that make up each element, the patron’s sensual appreciation of these materials deepens. For intance, the cool straight rigidity of the steel and glass wine vault accentuates the rough texture of the plaster wall adjacent to it. 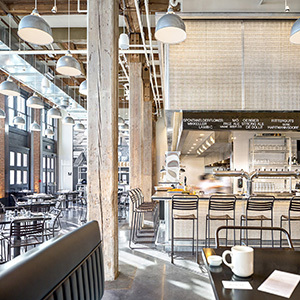 Similarly, the syncopated rhythm of the new wood-plank ceiling and wall of the bar emphasizes the pattern of existing steel ceiling plates from which Nabisco’s bakery equipment used to hang. The expression of the unit parts that make up each old and new element forges a connection between what is seen and how it is made. All furnishings and fittings, such as the walnut and steel dining tables, were designed to celebrate their materials and the simple craftsmanship used to assemble them. The absence of any protective coating (other than beeswax) on the oak, steel, and leather elsewhere, intentionally promotes their ability to age with grace.